The famous Vasari corridor – realized by the architect Giorgio Vasari – connects the Palazzo Vecchio with the Palazzo Pitti, the two palaces of the power in Florence. The first one – which is in Piazza della Signoria – is the location of the political power, the secondo one was the Medici palace. The well-known architect – creator also of the Uffizi palace – built this passage that joins the two Arno’s banks by passing through Ponte Vecchio. It represents a real architectural innovation and it tells us, along the way, some important episodes of the Florentine history. The corridor was commissioned in 1565 by the Gran Duke Cosimo I and it was realized just in five months. The corridor gave the opportunity to move freely to the members of the Medici family through the centre of the town: it was a period in which the support of the population to the Gran Duke was not predicted. In the part of the Uffizi Gallery we meet one of saddest episode of the recent history of Florence: the massacre of Via dei Georgofili. It was caused by the Mafia in 1993. A very powerful bomb damaged also a part of the corridor and some artworks of the Uffizi went lost. Some painting – deeply damaged – are still exhibited in their original location, to remember the pain of the town. Once you pass the Uffizi Gallery, you arrive to the Ponte Vecchio. Until the corridor was built, the bridge hosted the meat market, then it was relocated and the goldsmiths arrived. They are still on the bridge with their characteristic workshops. The members of the Medici family could not bear the bad smells, of course! They could not even have be noticed! For this reason, the corridor had just small windows, from which they could observe everything that happened outside. Nowadays there are some big windows at the centre of the bridge, oriented towards the Santa Trinita bridge. They were enlarged in 1939, when Hitler visited Florence. It seems that the German dictator decided to save Ponte Vecchio because of this beautiful scene, but he destroyed all the others bridges in Florence. Germans also bombed the banks near the Ponte Vecchio and the corridor was damaged too: it also lost some of his ancient parts. Precisely because of the destruction of the other bridges, during the II World War the Vasari corridor became the most used passage by citizens and partisans to move along the north-south axis of Florence. In fact, even if the corridor had been a private passage during his first 200 years, it became a public one when Lorena family arrived in town and they opened the Uffizi to the population. After crossing the Arno, the corridor circumvents the tower of the Mannelli family that – unlike others families – resolutely opposed to the crossing of its property. So Vasari had to realized one of the most characteristic section of the corridor. Then the passage opens inside the church of Santa Felicita: from here the Gran Duke and his family could join their own seat. After passing on the side of some noble palaces in Via Guicciardini, the corridor arrives in the Boboli gardens, near the Grotta di Buontalenti, and it finished in the Palazzo Pitti. The most ancient collection of self-portraits began to take form in the corridor, since the 17th century. Nowadays the collection have more than 500 paintings. 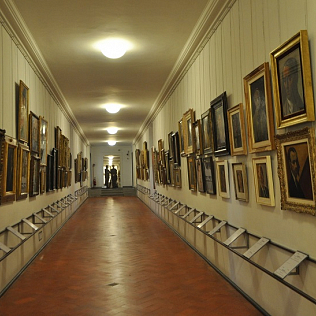 In fact, Vasari corridor is part of the Uffizi Gallery and it hosts some important artworks from17th-18th centuries. The spaces of the corridor are very restricted, so visits are reserved to little guided groups, and sometimes they are totally interrupted. Vasari corridor is one of the most characteristic building in Florence, closely tied to the history of the town and of the Uffizi.